If you’re searching for apartments for rent in Littleton then you’re in luck because at Summit Riverside Apartments we have a number of amazing amenities, great floor plans, and a wonderful neighborhood to enjoy. Apartments feature stainless steel appliances, designer flooring, patios and balconies, wood-burning fireplaces, walk-in closets, central heating and air, and more. In other words, there’s a lot to love about living here! It is our opinion that the community around here is one of the absolute best things about living at Summit Riverside Apartments in Littleton. Everyone here is so kind and friendly that you’re sure to be welcomed with open arms. It’s with that thought in mind that we present today’s post to you. Everyone wants to have good neighbors and to be a good neighbor as well, so in today’s post we thought we’d share a few tips on how to do just that. Keep reading to learn more! One of the best things you can do when moving into a new living space is making it a point to meet your neighbors. After all, the more people you know the better! We’d recommend meeting the people on either side of your apartment at the least, but we think you’ll find that people at Summit Riverside Apartments are incredibly friendly. Either way, the end result of being a little sociable is that you’ll live in a community that feels that much more like home. 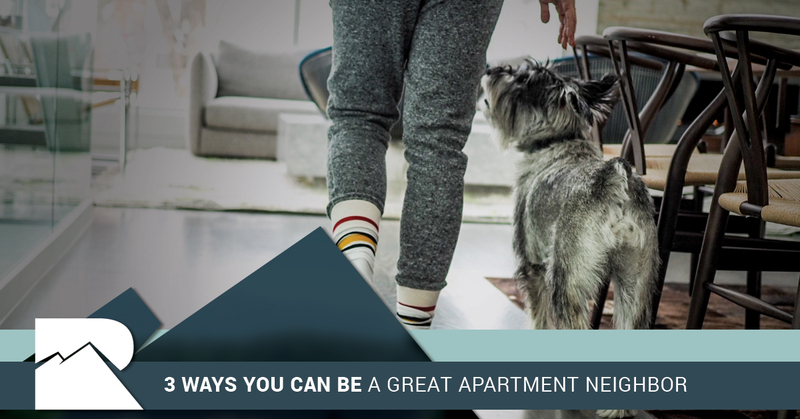 You probably know just how difficult it can be to find pet-friendly apartments in Littleton, but if you have a four-legged friend that’s a part of your family then you’ll be happy to hear that we have a great pet policy here. There are a handful of breed restrictions, but generally speaking we’d love to have your pet as a part of our community! After all, we’re a pet-loving community with barkday pawties! As a pet owner you are no doubt aware of how non pet owners can perceive animals sometimes. That’s why it’s so important to train your pets well. You might love them, but to someone else they can be frustrating. If your pets are trained well, however, then there’s a much greater chance that your neighbors will love your pup just as much as you do! We know what you’re thinking, and yes, this is apartment 101. It’s good to have a reminder every so often, however, and we believe that being respectful of those around you is one of the absolute most important things you can do when you live in an apartment. Keep in mind the fact that you have shared walls and do your best to keep noise levels down. Similarly, creating an outdoor space that is welcoming can go a long way towards showing others that you care about your living space. No matter the situation you’ll find that being quiet is the way to go. If you have an event planned, be sure to communicate with your neighbors. After all, good communication is key and being on the same page as those who surround you is always going to be in your best interest. As we mentioned at the beginning of this post, Summit Riverside Apartments in Littleton offer an incredibly friendly community of people. We think that you will appreciate the beautiful apartments, the amazing surroundings, and the kind and friendly neighbors here. You don’t have to take our word for it either. Contact us today to schedule a tour and see our apartment complex for yourself. We look forward to hearing from you and we’d love to show you around.